Jeff Groman is the owner of the Classic Cycle store on Winslow Way and curator of the adjoining museum of cycling history. 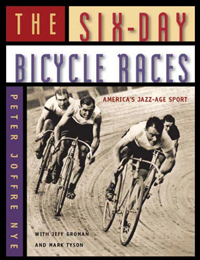 In 2006 he co-authored, along with Peter Joffre Nye as principal author and Mark Tyson, the book The Six-Day Bicycle Races: America's Jazz Age Sport. The well-researched account traces the history of a forgotten sport, from its early days in the 1880's through its heyday in the 1920's and 30's, and its demise in the 1950's. Readers learn that prior to WW II, every major city in North America had its own bicycle race. Movie stars, politicians, jazz musicians, and gangsters mixed with regular sports fans at the races, creating an atmosphere not found in any other sport since then. Perhaps the most outstanding feature of The Six-Day Bicycle Races are its stunning photos. Historic pictures from Groman's own collection of vintage cycling photographs bring to life a chapter in sports history most of us know little about. The Six-Day Bicycle Races has also been made into a documentary film by the same title, narrated by NPR’s Frank Deford. For more information on the book, the film, and a gallery of great pictures from the history of cycling please go to http://www.sixdaybicyclerace.com. You may also want to stop by the cycling museum next time you are in downtown Winslow.